Synopsis: Love speaks in flowers. Truth requires thorns. Review: I am going to admit, I am not the biggest Grishaverse fan out there. I don’t dislike by any means, I just have mixed feelings about some of it – but I am still intrigued by the world and I will continue to read stories within it. So some background on my feelings of this world. I was disappointed with the Grisha Trilogy. Although I did really enjoy Shadow and Bone, I was disappointed by the end of the series. I felt that some major aspects of the story that I loved where thrown away and there were so many missed opportunities in the story. But I still loved the world that Leigh Bardugo had created. Which lead me to Six of Crows. I really enjoyed Six of Crows! I said in my review “If the character development continues to be as strong in the sequels as it was in Six of Crows, I dare to say that this will be a better series than the The Grisha trilogy”. And I still stand by that statement. Which is maybe why I haven’t yet read Crooked Kingdom. I know, I can hear the gasps of Grisha fans everywhere. But to be honest, I am actually a little scared to read it. I am fearful that the story will go downhill (for me) like the Grisha Trilogy did, and I just don’t know if I can handle that. You don’t understand how sad that trilogy made me. So, in saying all that… I still hold out so much hope for this universe. There is so much potential in it. 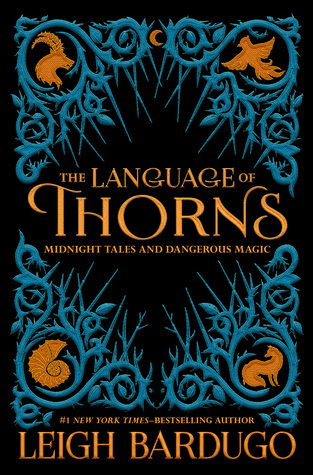 Which is why I was excited when The Language Thorns came out. I felt this was going to be a book in this world (sort of) that doesn’t really have the potential to let me down. So what did I think? This book is filled with so many things in it to love. It is connected to Grisha world, but not directly. It is fairy tales. And it is gorgeously illustrated! This book is filled with Grishaverse folklore, but the influence of our (real world) fairy tales is strong! So, it is basically a fairy tale retelling, being told as fairy tales. Grimm style. Genius! I love dark fairy tales. I love fairy tale retellings. I love illustrations. OMG – so much to love! I found these stories to be enchanting (in a twisted way). There are sweet characters and evil characters, hope and dashed dreams, betrayal and revenge. And the illustrations – WOW! Sara Kipin is the illustrator, and her intricate illustrations were just as captivating as the stories themselves. The illustrations grow with each turn of the page, so you are watching the story develop through the illustrations as the story progresses. I cannot rave about this amazing storytelling style enough. I adored it. There are six stories in all, three of which are new. However even if you have read the three that have been previously released, you still in for a magical treat! The storytelling is captivating and the illustrations are stunning. Normally I would consider breaking down each story and providing a little summary on each. But these stories are not very long so I thought it is best to leave things unsaid so you can enjoy them to yourself. But note that there was not one story I didn’t like. All six stories are solid and magical and each one is filled with breathtaking illustrations. So whether or not you are a Grishaverse fan, get your hands on this amazing book, you will not be disappointed!